Growing table is a great grower – as well as your child. The legs of the table, stool and bench are adjustable to four different heights thanks to their uncomplicated screw system. Beginning from the second life of year. Its tools are also practical: the mobile holders for pens, drawing rolls and books are simply placed in the holes at the borders of the table. 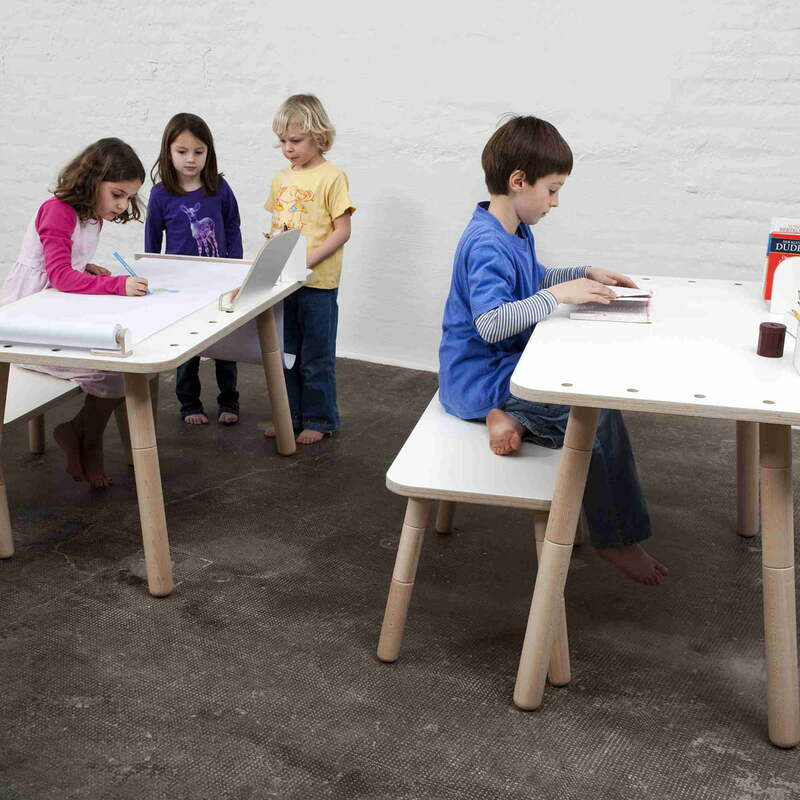 That makes growing table the perfect company for playing and working young ones. How good that there is enough place for two on the bench, when friends com for a visit or the small brother wants a little company. Growing Table is completely demountable and place sparingly storable in the package if there is another offspring to come. With the age, your child's demands change. More storage room for books? Adapt the tools individually to your child's demands. Whether a pen box or book board, every single part is separately available. What have rustic furniture for a doing with growing tables? Growing Table is as rustic and long lasting, its form-speaking as simple. However, the details are new and contemporaneous. Volume, slightly diagonal oriented legs hold the 25 mm strong boards from the table, stool and bench. This makes Growing Table extremely stabile and gives a typical, friendly look to it. Three parts, four steps: that is the flexible and simple principle of the height adjustment of Growing Table's legs. For the smallest ones, the growing table begins with a height of 1. From the second height, one element is added, and so on until the 4th step is reached, meaning a maximal working height of 72 cm. With the tools from Growing Table, your child keeps a good overview. The handy boxes adopt pens and papers, books come into the board or are placed on the book-holder to be read- Thereby your child does always decide how the elements are ordered on the holes. A whole lot of space for creativity. A pictures roll, that has the size of the table keeps the learning and playing time interesting and exciting. 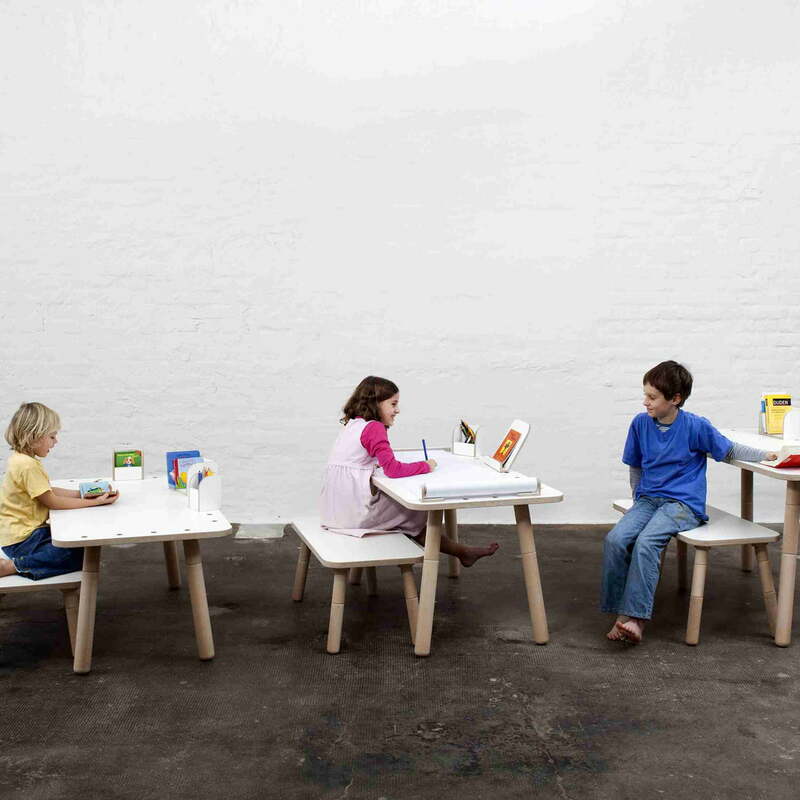 Growing Table is available in two different editions: in natural beech wood or white beech wood, coated. The legs are made out of homely massive beech wood: it is natural and bright lacquered. 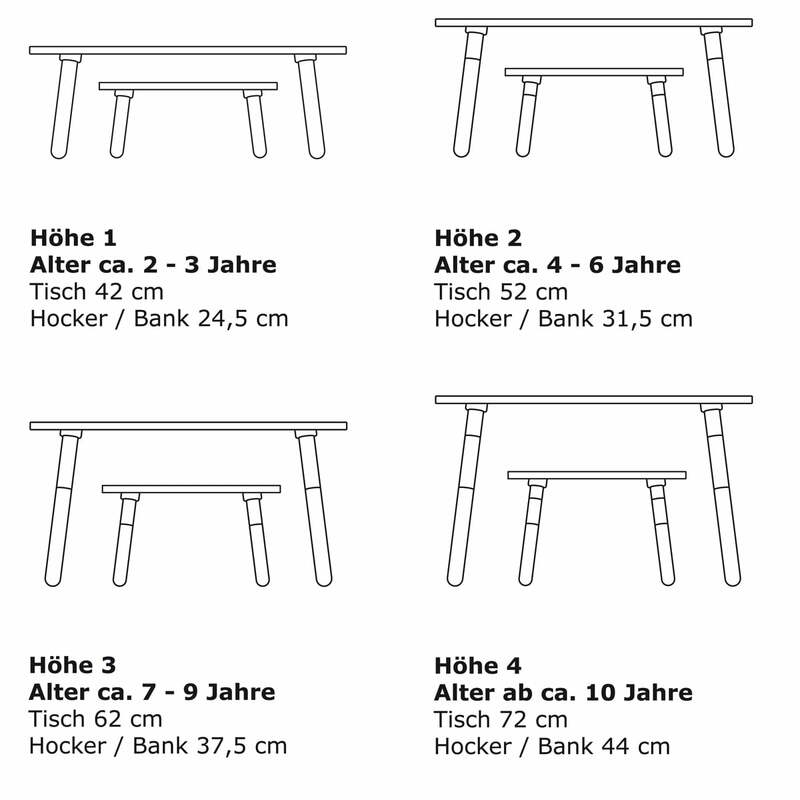 The Growing Table is produced by a German manufacture for handicapped people. The Pure Position manufacturer has created a whole concept. The Growing Table, the seating, the container and various table accessories are part of the fully equipped desk. 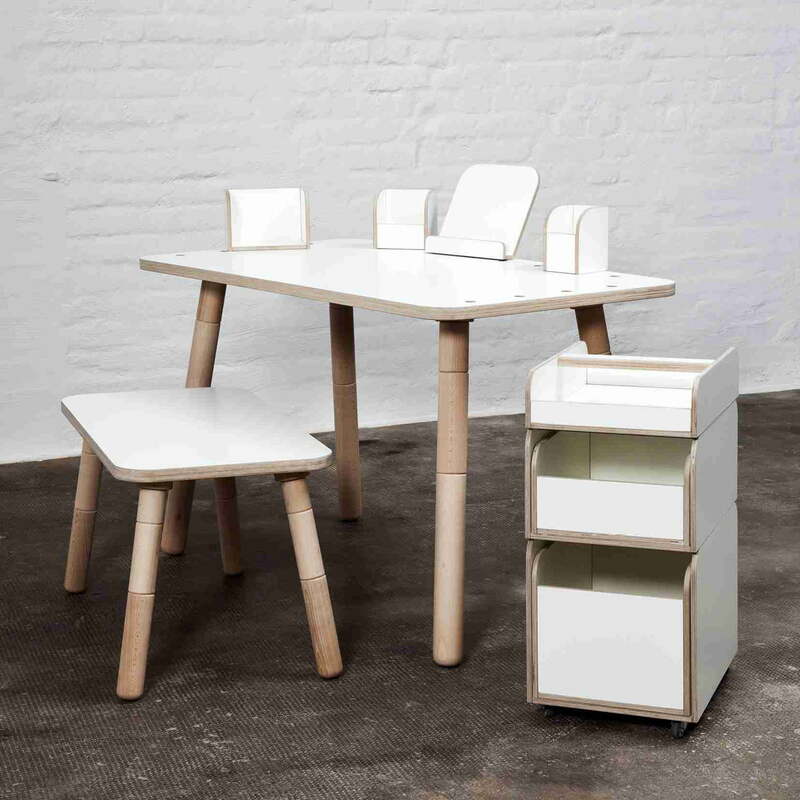 The Growing Table is available in two different editions: in natural beech wood or white coated beech wood. 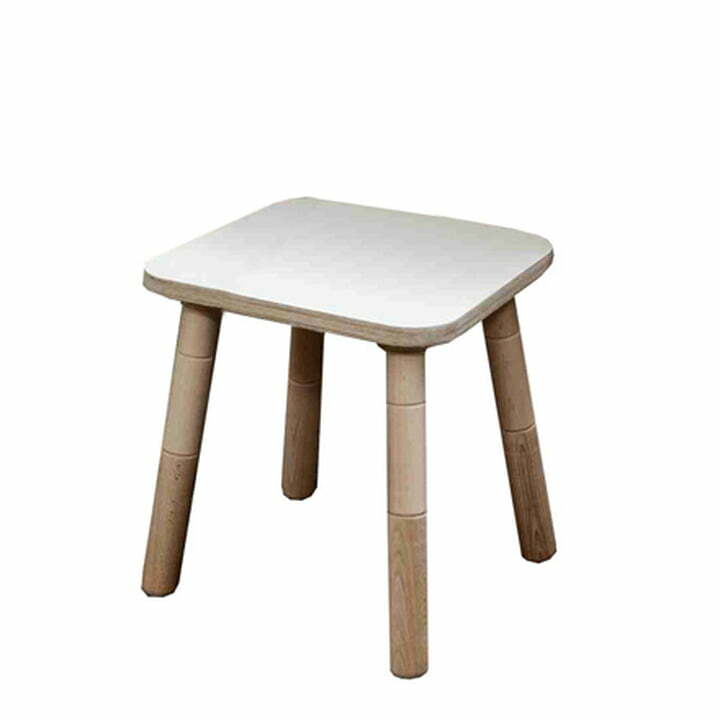 The legs are made out of domestic solid beech: natural with a clear varnish. 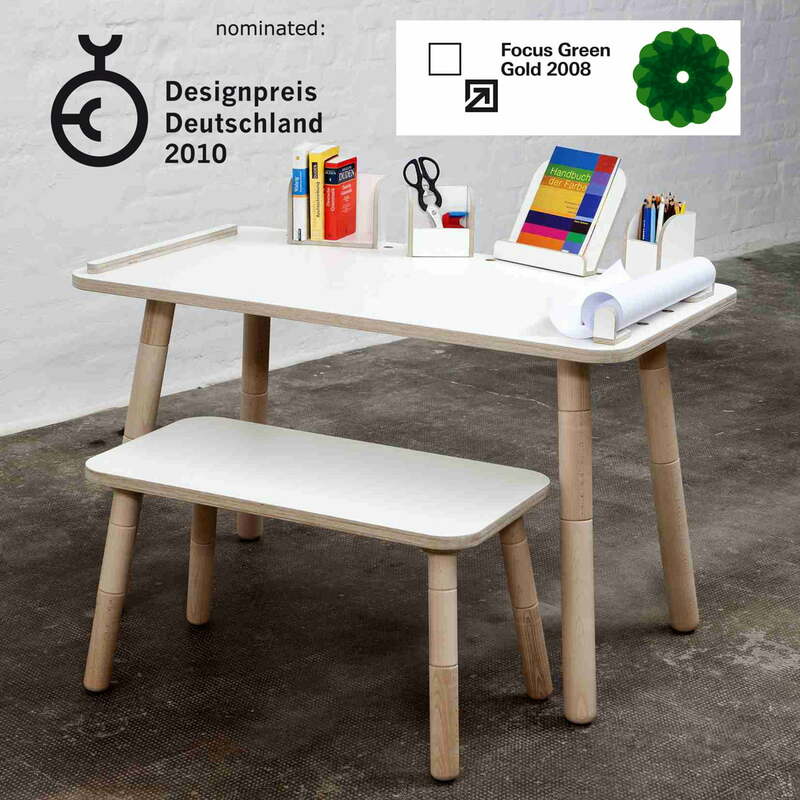 The Growing Table furniture by Pure Position has won several awards and been nominated for important design awards. Growing table is robust and long-living. 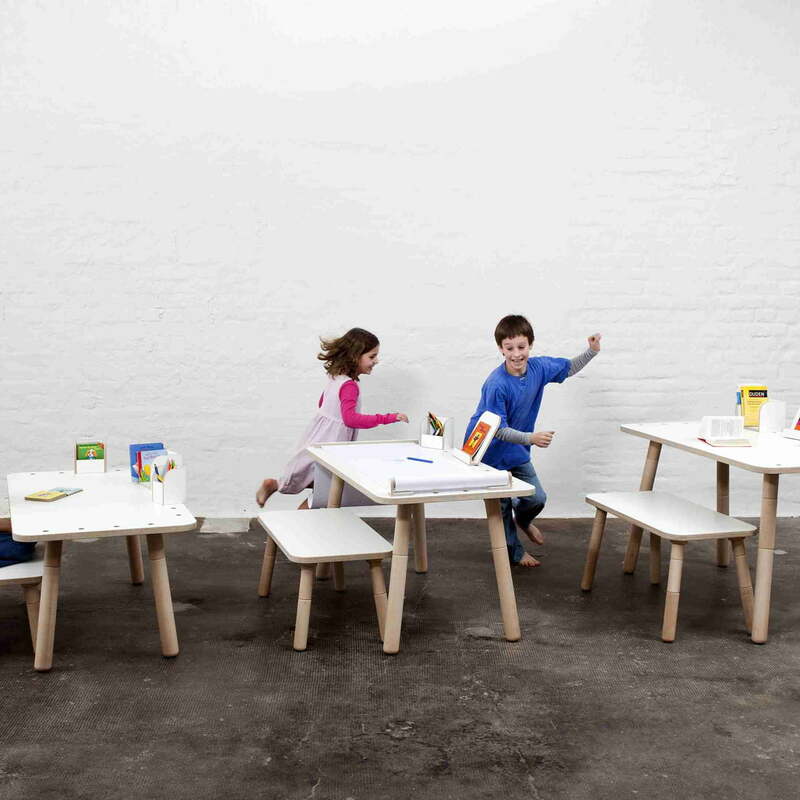 The Growing Table is able to accompany children form nursery school throughout primary school and grows with them. The furniture is made of sustainable wood.